The proposed Site C project on the Peace River is all about providing secure capacity in British Columbia's sustainable energy supply. For a transition to a blend of sustainable sources from solar photovoltaic, solar thermal, wind, run-of-river and tidal sources, we face the severe problem that all of these are intermittent. 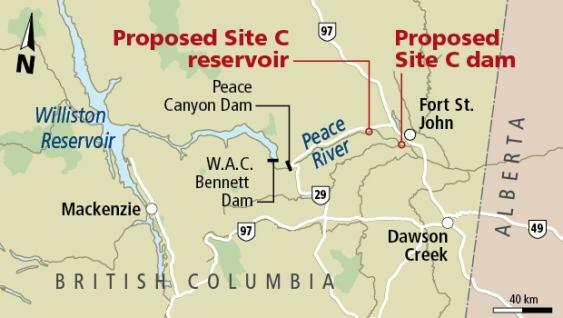 The development of Site C on the Peace would create three sequential reservoirs to offer an as-needed supply of power, manageable on all time scales from minutes to months. Only the Columbia River system, which already consists of a comparable sequence of reservoirs, offers this degree of freedom to top up intermittent sources with hydro power. If we truly envision a future in which all of our energy comes from sustainable sources, Site C is an essential element to that goal. Without a reliable backup supply, the green energy revolution will be stillborn. It's really that simple. British Columbia gets a higher percentage of primary energy from sustainables than the national average, because 93-98% of our electricity comes from hydro. The exception occurs on Vancouver Island, where up to one third of the Island's electricity comes from Capital Energy's gas-fired generator at Campbell River. Regardless of the exact figures for BC, we still get roughly 4/5th of our total energy needs from fossil sources. That is the real problem that we must address if we want to reduce carbon emissions. To stop the rise of atmospheric CO2, we need to increase the amount of sustainable energy to at least 80% of our total energy supply (some would say to 100%). That is to say, we need something like a fourfold increase in sustainable energy to displace fossil power, at current economic activity levels. BC Hydro has rarely (if ever) acknowledged a role to displace fossil power. We have rarely (if ever) put numbers to the magnitude of the supply challenge we face to displace fossil power. Any statement that we don't need additional electrical power is clearly a falsehood. Sustainably generated electricity is the only significant choice we have to replace fossil energy. Since sun and wind are intermittent sources of electricity, we clearly need to increase discretionary (reserve) hydro capacity in order to offset the interruptibility of solar and wind power. We cannot forecast with certainty which mix of photovoltaic, wind, run-of-river, etc will prove optimal in the coming decades. For example, few could have accurately predicted the astounding drop in the cost of photovoltaic cells. But given that this has happened, it is driving a dramatic rise in photovoltaic electricity at this time. So it's becoming a fair bet that solar photovoltaic electricity is poised to dominate the sustainability revolution. Its advantages are that it is cheap, easily installed & integrated, and scalable in application from single households to vast arrays powering a whole state or jurisdiction. Theoretically the USA could meet all its electrical needs in daylight hours from photovoltaic. Many regions of Canada could meet their needs from photovoltaic, the exceptions being mostly in the polar regions, which experience long periods of darkness. The salient question is: how far can solar photovoltaic generation grow before hitting a limit? An obvious limit is set by the fact that the sun doesn't shine at night. What happens when the sun goes down? The glib answer, that we’ll get it from other places were the sun is shining, is nonsense for us on the west coast of North America. When the sun goes down here, it has set over all the Americas. We won’t get photovoltaic from the Pacific Ocean nor from Japan. We can’t rely on wind to blow every evening (when it usually calms down, and when demand for electricity peaks) to fill the gap. So the solar photovoltaic revolution will be stopped dead in its tracks unless we build an always-available backup supply. The idea that this backup will come from super-batteries is a myth, because chemistry has its limits. The best source of chemical energy (that is, with a high energy density value) is from hydrocarbons, which we're trying to get away from. For example, a rechargeable lithium-ion battery typically has about 100 times the mass of gasoline to deliver the same amount of energy. Also, lithium, which delivers the best electrochemical storage, is a rare and very expensive element. There simply isn't enough of it to power the world. Batteries can supply single homes and small operations, but simply can’t be scaled in an environmentally responsible and economically viable way to supply whole cities. The gravitational energy of water at elevation, that is hydro, is and always will be the only safe, natural and convenient way to store vast amounts of energy for use when needed. Reservoir-to-reservoir hydro generation is the natural solution to intermittency problems. It allows power can be generated as needed, without causing severe downstream effects. The three Peace Dams (Bennett, Peace Canyon, and Site C) can be major contributors to the nighttime supply, if properly engineered to maximize their capacity. The Columbia River reservoirs can also fulfil this function. Additional capacity being installed at the Mica and Revelstoke dams will provide some of this. An alternative or additional step would be to nationalize back the Nechako reservoir, which could provide1.6 GW power during the hours of darkness, within the allotted water rights. The second penstock tunnel to reach this capacity is already built, but sits unused, since Alcan (now Rio Tinto Alcan) abandoned its project in the 1990s. The argument that we already have sufficient capacity is not true. BC Hydro's reserve capacity is typically around 5%, or 3 GW. For 100% sustainable energy, we will need many times more than this. Hopefully, geothermal generation could and will fulfil a constant base load component. The only other option to deal with intermittency is to build 1 MW of gas-fired generation for every 1 MW of intermittent generation. If we choose that route, we are clearly abandoning any hope of carbon-free energy. The result of this choice is certain: catastrophic climate change will ensue. It's there whenever you need it. If it's always available when you need it, and cheap enough, it will naturally displace fossil energy on its merits. It's almost carbon emissions-free, and generally environmentally neutral. This seems to imply that we don't need additional electrical generation. How then do we replace fossil energy, which still supplies four-fifths of our primary energy supply? Simply cutting back on our total primary energy supply will put us all back in the stone age. "Electrical demand in British Columbia has plateaued." Sadly, this is true. Through its 'Power Smart' program, BC Hydro has has always campaigned to limit electrical use. The fact is that most of the changes they suggest to limit your electrical use actually increase your fossil fuel use. If you do the environmentally wise thing, and heat your dwelling with a heat pump, you will be immediately punished by a 50% increase in your hydro rate per kilowatt-hour as you move from Tier 1 to Tier 2 rates. BC Hydro's Integrated Resource Plan (IRP) makes no real goal or consideration to displace fossil energy – which is our most urgent task! It seems obvious that BC Hydro has been run for the benefit of the fossil fuel industry, rather than serving as the replacement for it. BC Hydro needs to plan ahead of the market, and beyond provincial borders. It has clearly not done this yet. In that sense, a new IRP is needed. Electrical energy has been depicted as the problem, while in fact it is the only viable solution to our energy & climate problems. In BC, the Hydro rate policy, plus the lack of long-term planning, represent a political problem. They require a political solution. Unfortunately, no political party in BC is presently offering a solution. "It will create an immediate oversupply of electricity”. Once again the myth of too much electricity is repeated. Electricity can displace fossil fuels for all building heating and operations: it can replace fossil fuels for most transportation purposes. These uses alone account for about two-thirds of our present carbon emissions. Solar/hydro-produced electricity will be cheap enough to displace fossil energy by market forces alone. No contrived taxes or regulation will be required for this transformation. "The electricity from Site C will only be used to process LNG, or to increase our fossil fuel extraction." Well, the Christy Clark government really muddied the political waters with its plan to use Site C electricity to liquify natural gas. In that case, its energy would be entirely consumed in cooling natural gas to -160 Celsius in order to liquify it; that energy is 100% wasted and unrecoverable. Fortunately the mad schemes of politicians are no match for physical law and the realities of market economics. We all know that the massive LNG projects talked about will never happen in British Columbia. The power from Site C can be 100% used to displace fossil fuels from our primary energy supply. "Demand-side Management will solve the intermittency problem of sustainable energy." It is impossible to make the case that demand-side management is superior to supply-side management. The big advantage that fossil energy has enjoyed is that it's there when you need it. Once electricity is always there when you need it, its other advantages (cost, ease of transmission, scalability, environmentally cleanliness) will allow it to displace fossil power. Demand-side management is simply not an issue when you have over two years supply of water behind the W.A.C. Bennett dam. Doesn't it make more sense to use this relatively unique advantage we have in BC? We can deliver electrical power anytime, at a fixed rate. Other jurisdictions can't. This is a huge advantage we should be using to draw investment into our province. Demand-side management is the reality faced by jurisdictions without a backup power generation capacity. To put it very bluntly, demand-side management is for losers. This suggests that some magic of chemistry or physics will somehow emerge to solve intermittency of supply. That simply won't happen. The truth is there is only one method of energy storage that is almost 100% efficient and totally scalable: water at elevation. The technology we already have is the best there ever will be. We need to expand stored capacity if we are to make progress in sustainable use of energy. "Superbatteries will solve the energy storage problem." We've been developing batteries for centuries. The limits of chemistry and chemical energy storage should be pretty clear by now. Batteries typically require about fifty times the mass of fossil fuels to store the same amount of chemical energy. There will be progress in battery technology, but it won't be spectacular, and it is incapable of solving the energy storage problem on a societal scale. Is there something wrong with that? Isn't it precisely megaprojects that make the plethora of smaller projects possible? This is especially true when it comes to the question of energy. It seems obvious our energy future requires a mix of large and small facilities: the large enable the small to happen, wherever they are needed. "Gas-fired generation can solve the intermittency problem." Yes, but you'll need a gigawatt of gas-fired generation for each gigawatt of wind or solar generation. That hardly leads to CO2 reduction and a climate solution. "Solar photovoltaic electricity is already cheaper, and getting cheaper everyday." Yes, but solarPV cannot deliver a stand-alone solution, because the sun sets. In fact the spectacular rise of solarPV puts increased urgency of the need for nighttime power generation that Site C could supply. 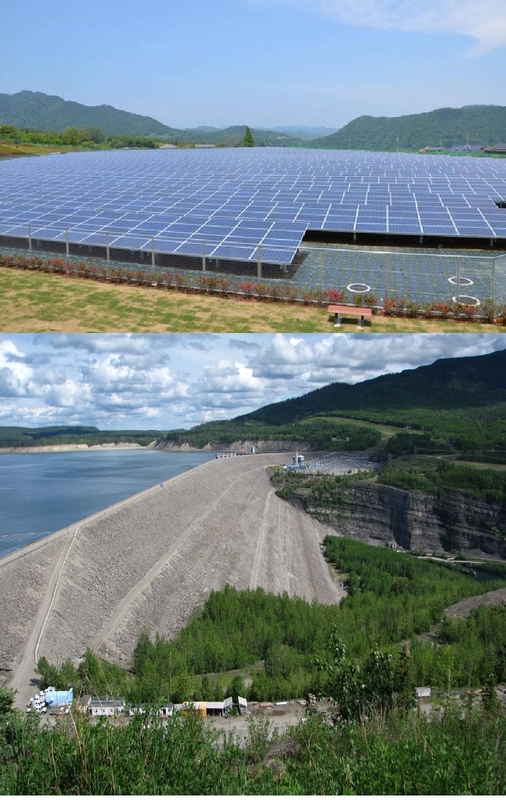 The cheaper solarPV power gets, the more we need Site C to complement it. That's the reality. "Wind generation will solve our electrical needs." BC Hydro estimates that it can currently integrate 3,000 MW of wind capacity onto its system”. This represents only 5% of generating capacity, so BC Hydro is effectively saying they will limit wind generation to 5% of the electrical supply. Compare that with what Denmark and Germany are already doing with wind: at times it suffices for all their electrical needs. With the ability to store power in reservoirs such as Site C, we essentially erase the limits to how much wind-generated electricity we can handle. "Geothermal electrical generation could supply all our energy needs." This is almost certainly true. But so far, we do not have a single large-scale geothermal power plant in Canada to demonstrate that it can deliver energy in a cost-efficient manner. It's unrealistic to believe that geothermal can power Canada cost-efficiently when no proof-of-concept power station has yet been built in this country. "Treaty rights have been violated." BC Hydro has consulted Treaty 8 and other First Nations groups for a decade, and some settlement of claim has been made. First nations' rights are indeed important. They must be suitably consulted and accommodated. But we do not grant an absolute veto to any citizen group, aboriginal or otherwise, against the common good. Actually, optimization of the power system with its existing grid capacity from Treaty 8 lands offers these communities an incredible opportunity to lead the sustainability revolution with solarPV and wind generation from their lands. The manageability of Site C's generation capacity is what makes the those power sources viable in the first place. The most-cost effective wind resource in BC is found in the Peace River region. First nations have already become leaders in run-of-river and wind power projects. We can do this together. "The environmental impacts will be hugely negative." We need to acknowledge that that the natural flow of the Peace River has already been disrupted by the two existing power dams. With a third dam and three reservoirs, there is far more freedom to operate reservoir-to-reservoir release to produce more desirable downstream effects, including a restoration of the natural river flow. Site C potentially can have a very positive environmental impact. "Hydro dams consume so much water." Hydro dams do not consume water: every drop is conserved: what goes in comes out. What the hydro generators do is harvest the gravitational energy of the water, which was imparted to it by the sun, via the hydrologic cycle. "Reservoirs are huge sources of carbon dioxide and methane." This statement is a total misrepresentation of the carbon cycle. Bodies of water do not create carbon dioxide or methane, but they can absorb, transport and release them. Biomass will create those gases with or without water reservoirs. "Hydroelectric dams and reservoirs are not clean sources of carbon-free energy." "The flooded farmland could feed a million people." This widely quoted claim has no quantitative basis. At present, only about one quarter of the land to be flooded at Site C is actualy under cultivation. Most of that farmland is used to grow animal fodder, not human food. Agricultural productivity of the Peace River region is now limited by the extreme temperatures, which produce a very short growing season from last frost to first frost. Large bodies of water do mitigate such temperature extremes. The Site C reservoir might actually increase agricultural productivity of the Peace region by moderating temperatures, and lengthening the growing season. "The soils in the valley are the best agricultural soils." The valley contains a mix of soils; some are poor. Actually, the best agricultural soils in Canada would be found underwater on the bottoms of freshwater lakes and rivers that cover about 9% of Canada. No one is proposing that we drain all those bodies of water in order to farm them. "The Peace Valley is too precious and beautiful to flood." It's one thing to argue against flooding valleys when the remaining land is entirely rock and mountaintop. That is simply not the case in the deep soils east of the Rockies. There the surrounding terrain is all flat, rich, fertile agricultural land. The Peace Valley is indeed beautiful. Yet, there will always remain hundreds of kilometers of the Peace Valley just as beautiful. 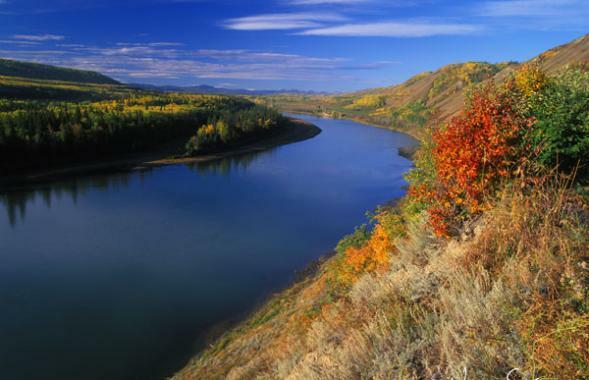 There are many other beautiful rivers flowing from the Rockies onto the prairies. And remember, the lake formed by the new reservoir will be pretty awesome sight to behold. It has often been stated that in order to address the real and present dangers of climate change from CO2, that we need to react in much the same way as did the Allies at the outbreak of World War II. That is, we need to mobilize all our efforts towards achieving a necessary goal. In 1939, the goal was the preservation of freedom and democracy. Today it is the preservation of a stable climate environment on our planet. Then as now there wasn't a perfect master plan of how the goal might be achieved. It just requires a total commitment to get it done. The climate war is truly underway. And we are losing. What we need to do to stop catastrophic global warming is simple enough: stop burning carbon! We do know there will be huge intermittency problems as we eliminate fossil fuels, and the only large scale solution to intermittency of supply will be water stored at elevation (that is to say hydro reservoirs). In short we very much will need Site C in any plausible scenario to eliminate our hydrocarbon dependence. Note: The original version of this paper was written in 2014. Since then, it has become even more obvious that solar photovoltaic power, coupled with hydro storage, will provide the most viable solution to climate change. They will provide the fastest, safest path to a more stable climate. The answer to the crisis is available right now. Read more: Electricity from the Sun is Einstein's greatest legacy.